Our article on Arizona Road Trips was a big hit, so we have gone ahead and done a Part 2 on Arizona Road Trips. After all, our landscape is diverse and there is a lot more to see in this state than first meets the eye! Here are a few more interesting destinations to consider. Arcosanti is a sci-fi mini city believed to have been the inspiration behind the iconic Star Wars movies. Indeed, when you visit Arcosanti, it’s like you’ve entered a Star Wars movie set. Arcosanti is about 70 miles to the north of Phoenix. You will find many strange looking dome-shaped and bubble-shaped buildings here, which you will not find anywhere else in the world. George Lucas, the creator of Star Wars, is said to have modeled his protagonist Luke Skywalker’s dusty home planet on Arcosanti. The architecture of Arcosanti is inspired by 1970s Modernism and sci-fi futurism. There is also a strong Middle Eastern and Italian influence here. The entire city was built by 7,000 volunteers and is still being built. Only about 80 people actually stay here, so at times it appears like an isolated, sparsely populated entirely different world. If you’ve been to Scottsdale, you can’t help noticing a tall, majestic mountain peak, four in a row, in the distance. It’s called Four Peaks, and is about 40 miles east-northeast of Phoenix. You can get there easily by car. Just take the Beeline Highway or the State Route 87. The mountains belong to the Four Peaks Wilderness Area, which spreads over an area of 60,740 acres. We would recommend an SUV or an all-wheel drive vehicle for the 28-mile long graded dirt road that takes you up and over the top. Be careful, watch out for the curves on the road and drive slowly. The view from the top is spectacular and well worth the journey. Tombstone is another of those towns of the Old West that simply refuse to die. There was a time when this town was at the epicenter of the mining boom, but today there’s no mining activity of any sort around here. 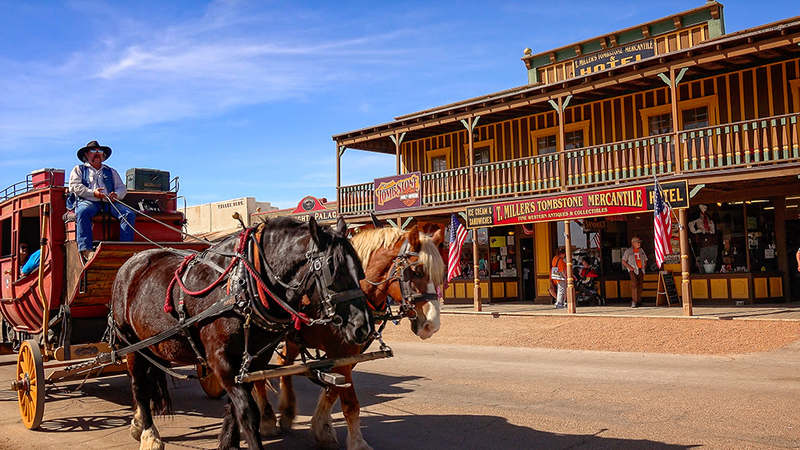 Today, Tombstone is a major tourist spot, and receives more than 500,000 visitors every year. There’s much to do and see here. There are actors dressed as cowboys and having mock gun fights on the streets, much like Clint Eastwood and company in The Good, the Bad and the Ugly. You can walk into the historic buildings that survived the great fire of 1881. Also, visit the mini-museum, you will find many interesting artifacts there from the 19th century. Crown King is a living ghost town in the Bradshaw Mountains of Arizona. It was once a famous gold mining town, it’s just that there’s no gold to be found here anymore. Today, Crown King is a popular tourist attraction, with spectacular views and fun-filled events such as the Annual Fall Corn Hole Showdown, Crown King One-Hole Golf Tournament and the World’s Shortest Memorial Day Parade. When in Crown King, visit the famous Crown King General Store, which has been around since 1904 and still in operation. Also worth a visit is the Oro Belle Saloon, which has been around for more than a hundred years. Crown King is about 65 miles to the north of Phoenix – however, be warned, the dirt road off the 17 to get there is long and bumpy! An all-wheel drive vehicle is definitely recommended for this one as well. The Grand Canyon is one of the most popular tourist attractions in Arizona, and really needs no introduction. It’s pretty far in the northwest of the state, at a 4–hour drive from Phoenix. Around 5.5 million people visit the Grand Canyon every year. Most visitors approach the Grand Canyon from the “South Rim”, which is open throughout the year. About 10 percent of visitors see the canyon from the North Rim of the Grand Canyon Park. This is about 10 miles across the South Rim, but to get there, you will have to travel 220 miles by car. The trip from the South Rim to the North Rim of the canyon is well worth it if you have the time to spare. Just remember the North Rim has a short season and is open from May 15th to October 15th of every year.